The annual Fiddler’s Green 5k is a dog friendly event! Help raise money for RAIN just by coming to walk/run the 5K or .9k with your dog and you can receive a finishers medal for yourself an a customized medal for your dog, too! 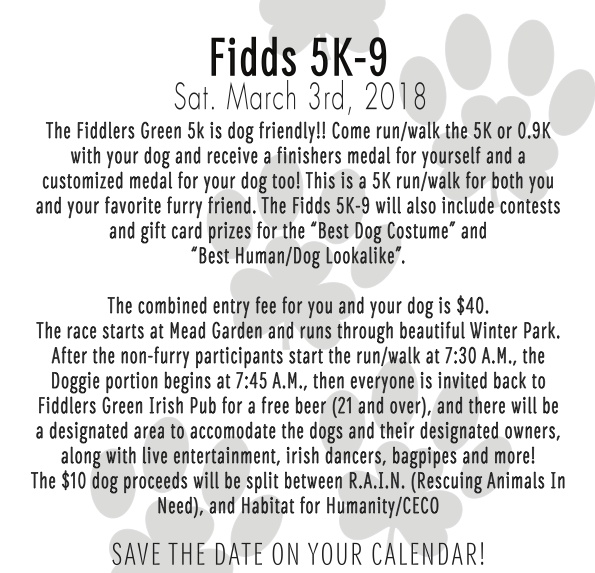 This is a 5K run.walk for both you and your furry friend! There will also be awesome events like contests and gift card prizes for the ‘Best Dog Costume” and “Best Human/Dog Lookalike”. The combined entry fee for you and your dog is $40. The race starts at Mead Garden and runs through beautiful Winter Park. 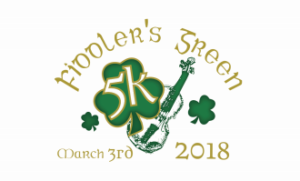 After the non-furry participants start the run/walk at 7:30AM the doggie portion begins at 7:45AM, then everyone is invited back to Fiddler’s Green Irish Pub for a free beer (21 and over) and there will be a designed area to accommodate the dogs and their designated owners, along with live entertainment, Irish dancers, bagpipes and more! The $10 dog proceeds will be split between us and Habitat for Humanity/CECO! Please visit Fidds Gives website to get more information or to sign up!